The Fern and Mossery: Terrarium plants: micro mini sinningia! 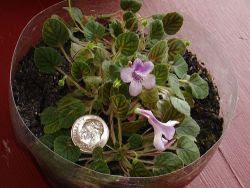 Terrarium plants: micro mini sinningia! a.) Supposedly they bloom almost non-stop in favorable conditions. b.) Supposedly they propagate easily (extra bonus for a limited-budget-multiple-terrarium-crafter such as myself). c.) There seem to be about a million varieties and colors! Try an Ebay search! I am going to order some right away. I have some thrift store glass containers and boxes which I think will be perfect homes for these little guys. Now I just need to get some perlite! And maybe an African Violet so I can test the lighting in some areas in my house. Of course I'll keep ya'll posted! I don't know if you have seen this link on how to grow them in a terrarium ? The tiny flowers look so lovely. Good luck. Actually there are only three species plants and about a dozen hybrids of the micro-miniature sinningias. The micro-miniatures all are colored in variations of purple to violet with a couple of them being just white. I have been growing them for over 10 years and I have just about all of them. There are a lot of miniature sinningias derived from crosses of the micro-minis and some larger sinningias, they come in many colors. I don't grow any of the miniatures, they're too big for me! Thanks for sharing, Linda. Do you keep the micro-minis in a terrarium? Hey there! Did you find a good source for these sweet little plants? Unfortunately, I have not! A few years ago I saw someone buying them online. Maybe I'll look again and I'll post if I find anything! Thanks!